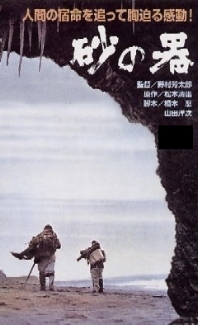 Castle of Sand (砂の器, Suna no utsuwa) is a 1974 Japanese police procedural directed by Yoshitarō Nomura, based on the novel Inspector Imanishi Investigates by Seicho Matsumoto. Yoshitaro Nomura’s 1974 film of Seicho Matsumoto’s immensely popular detective story tells the tale of two detectives, Imanishi (Tetsuro Tamba) and Yoshimura (Kensaku Morita), tasked with tracking down the murderer of an old man, found bludgeoned to death in a rail yard. When the identity of the old man can't be determined, the investigation focuses on the only other clue: a scrap of conversation overheard at a bar between the old man and a younger one. A witness recalls the cryptic phrases "Kameda did this" and "Kameda doesn't change." This sets off a wide-ranging investigation that covers vast swaths of geography, changing social mores, and time. The investigation ends with an emotional and heartbreaking conclusion, all the more shattering because the reason for the crime need no longer exist in the world. Nominated for Golden Prize (Yoshitaro Nomura). ^ "9th Moscow International Film Festival (1975)". MIFF. Archived from the original on 2013-01-16. Retrieved 2013-01-06. This article related to a Japanese film of the 1970s is a stub. You can help Wikipedia by expanding it. This page was last edited on 9 August 2018, at 12:58 (UTC).